A Colorful Arts and Crafts Adornment. Choose from a variety of great colors. 3/4" x 60 yds. 3" core. Great for arts and crafts projects. Sturdy crepe-finish paper tape. 3/4" x 60 yds. 3" core. 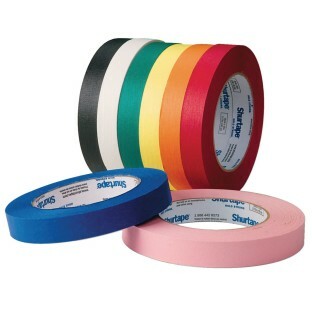 I was looking for masking tape in colors. This is going to work perfectly. We use colored masking tape at our church's VBS. The kids follow different colored masking tape lines to different activities in our facility.